Figs in the Bible refers to references to figs and fig trees in the Tanakh and the New Testament, which are sometimes symbolic. 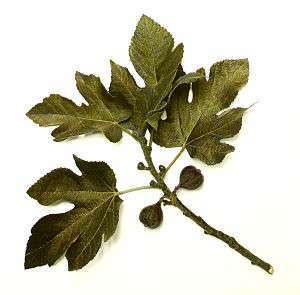 The fig tree is the third tree to be mentioned by name in the Hebrew Bible. The first is the Tree of life and the second is the Tree of the knowledge of good and evil. Adam and Eve used the leaves of the fig tree to sew garments for themselves after the Fall, when they realized that they were naked (Genesis 3:7). In Deuteronomy, the Promised Land is described as "a land of wheat and barley, of vines and fig trees and pomegranates, a land of olive oil and honey; a land where you will eat food without scarcity, in which you will not lack anything;" (Deuteronomy 8:8-10). During Solomon's reign Judah and Israel, from Dan to Beersheba, lived in safety, each man "under his own vine and fig tree" (1 Kings 4:25), an indicator of national wealth and prosperity. 2 Kings 18 states that Hezekiah rebelled against the King of Assyria, of whom he had become a vassal. In response, the Assyrian commander attempted to sway the army of Jerusalem by offering deserters each his own vine and fig tree. Proverbs 27:18 likens tending a fig tree to looking after one's master. There was a fig tree in the garden of the Song of Solomon, and in the year of love the tree formed its fruit early (Song 2:13). The fig tree and figs are featured in the Book of Jeremiah. Another species of ficus, the Egyptian sycamore fig is occasionally mentioned as well, for example 1 Kings 10:27. Then he said to the tree, "May no one ever eat fruit from you again." And his disciples heard him say it. On reaching Jerusalem, Jesus entered the temple area and began driving out those who were buying and selling there. He overturned the tables of the money changers and the benches of those selling doves, and would not allow anyone to carry merchandise through the temple courts. And as he taught them, he said, "Is it not written: " 'My house will be called a house of prayer for all nations'? But you have made it 'a den of robbers.'" The chief priests and the teachers of the law heard this and began looking for a way to kill him, for they feared him, because the whole crowd was amazed at his teaching. When evening came, they went out of the city. A parallel is found in Matthew 21:18–22, but the fig tree withers immediately and is noticed at that time by the disciples.